Certain aircraft create a loyal following and pilots will agree that there aren’t many high performance piston singles quite like the Rockwell Commander. This four seat, low wing aircraft was developed by Rockwell International in the early 70s. The rights were sold to Gulfstream American and later to Commander Aircraft in 1988. Although production ended in 2002, Commander 112s and 114s remain a greatly beloved aircraft. When Rockwell was designing the Commander Aircraft they started with a fixed gear version, the 111 as well as the retract version, the 112. Ultimately, the Commander 112 was the aircraft that made it to production with a 200hp I0-360 engine. Other models would follow, the 112A, 112B and the 112TC and 112TCA versions each with excellent tweaks to include increasing maximum takeoff weight and adding a turbocharged engine on the TC and TCA models. In 1976 the Commander 114 was introduced featuring a 260 horsepower engine. Three additional models followed: the 114A increased takeoff weight, the 114B featured a new propeller and updated cowling while the 114TC was turbocharged. The 114 hit cruise speeds of around 157 knots, almost 20 knots faster than its predecessor. Rockwell Commander fans can join other enthusiasts with a membership to The Commander Owners Group (COG). COG sponsors an annual fly in and the website hosts a wealth of commander information in their news section and in their member forums. Membership is just $75 a year. To join, visit https://www.commander.org/. 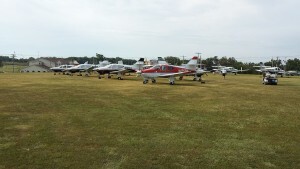 Commander aircraft owners place their trust in Aviation Insurance Resources (AIR). AIR shops all of the major aircraft insurance markets therefore providing the broadest coverage at the best rates available. Furthermore, all of our agents are pilots. Aviation is not just an industry we work in, it’s a passion we share with our clients every day. To obtain a Commander Aircraft insurance quote call 301-682-6200 or complete an online application today!